More than 3,700 bicycles were reported stolen in this city last year, a 26 per cent increase from 2014, according to new data obtained by CBC News from Toronto police. More than 3,700 bicycles were reported stolen in this city last year, a 26 per cent increase from 2014, according to new data obtained by CBC Toronto from police. Of the 3,728 bikes reported stolen in the city, only 49 were recovered. That's just over one per cent. The recovery rates in 2014 and 2015 were just as low. "I think it's abysmal," said Jared Kolb, executive director of Cycle Toronto. "The vast majority of our members are telling us that they are giving up on reporting bike thefts to the police." Everyone CBC Toronto interviewed for this story has had a bike stolen — including a police officer, who didn't report it. Marko Zdravkovski did report his bike stolen after it was taken from where he locked it outside his new Regent Park condo in September. It was the third bike he's lost to a thief since moving to Toronto six years ago from Macedonia. This time, he thought he had what he needed to catch the guy — surveillance video of the theft in broad daylight. But it turns out the thief might have known better. "On the footage the guy's taking his time to knock the lock," said Zdravkovski. "To me, what's surprising is why Toronto bike thieves are not scared of CCTV cameras. It means that the police don't go for them. The police don't care." Sgt. 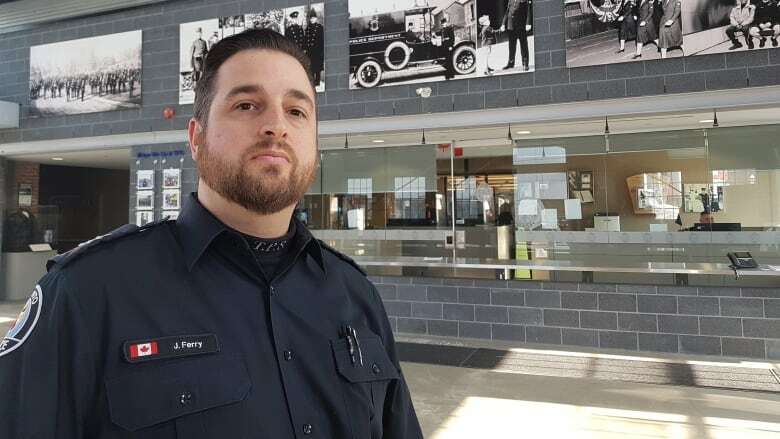 Jason Ferry from 51 Division, which is located in the Parliament Street and Front Street area, remembers watching that surveillance video, but says identifying the thief is the hardest part for police. "It is difficult for us to see somebody and then make a connection with that person and the theft of the bicycle," Ferry told CBC Toronto. Ferry says 51 Division has recently assigned an officer to deal specifically with bike thefts. In his role, the officer will use data from stolen bike reports to look for trends and pass on the information to front-line officers at the division "so they can be a little more proactive." "To have a bicycle stolen multiple times, it has to be frustrating," said Ferry. "Especially when you come to the police and we are working on it, but it can feel after the second or the third that maybe the help isn't there." Ferry had his own bike stolen in the city. It was locked up in his backyard at the time. "I didn't even report it stolen to be honest," said Ferry. "When it was stolen I knew the sad reality that you may not get your bike back." That's the case for most cyclists in Toronto — although not for most motorists. While around one per cent of bikes are returned to their owners each year, Ferry says motor vehicles are "usually recovered." The difference, he says, is that cars are "hard to convert" while bikes are "easily stolen, easily portable and easily converted into cash, either by selling them on the streets or through an online secondary market." To bike advocate Kolb, the discrepancy in recovery means police need to put more resources toward bike theft investigations. 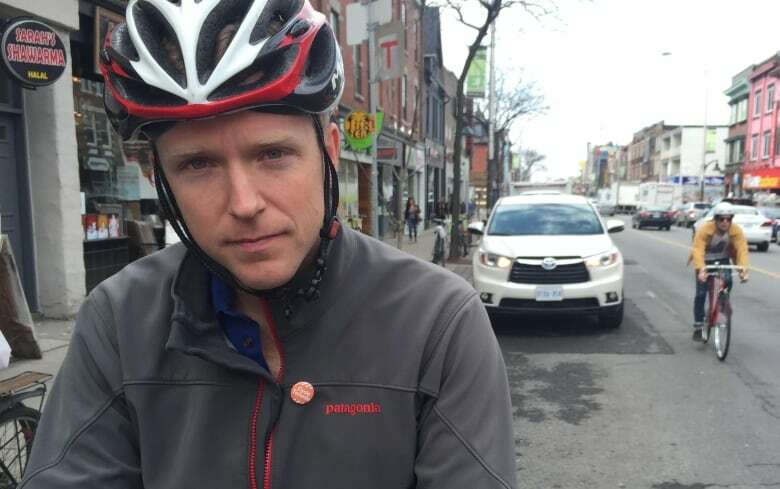 Jared Kolb, executive director of Cycle Toronto, says the majority of his members say they're giving up on reporting bike thefts to the police because it hasn't helped. 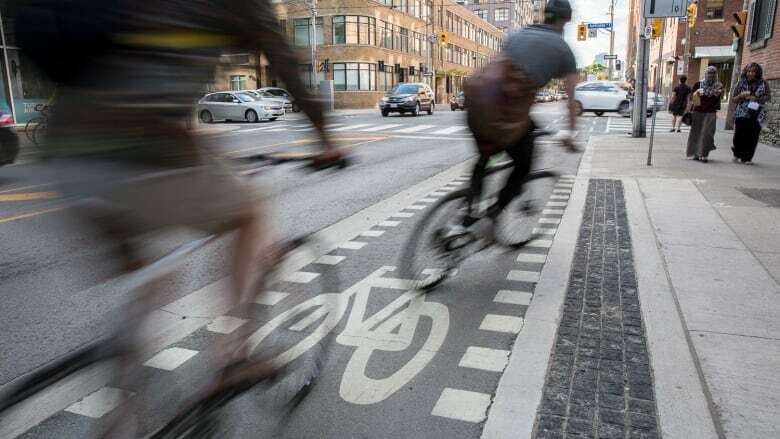 "We're seeing a great deal of people choosing cycling as the way that they get around," Kolb told CBC Toronto. "When their bicycle gets stolen it's effectively like their means of mobility has been pulled away from them." 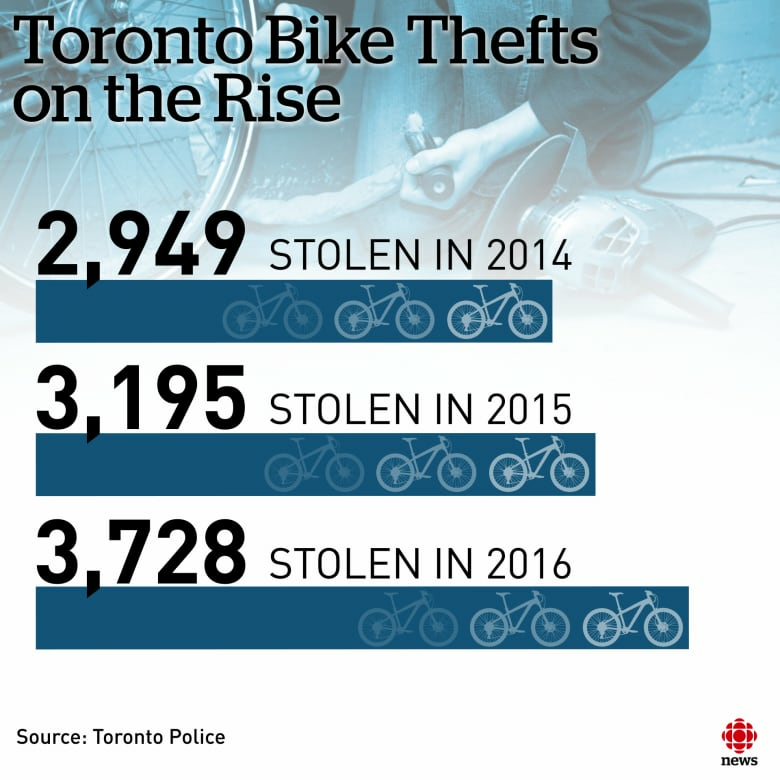 Numbers put together by the Toronto Police Service after requests from the cycling community, the city and a Freedom of Information request from CBC Toronto show the spike in bike thefts. Almost a decade ago, the number of reported thefts went down after notorious bike thief Igor Kenk was accused of stealing hundreds of bikes in 2008 and pleaded guilty the following year. While Kenk was operating his bike store, the number of bikes reported stolen hit a peak of over 4,500 in 2006 and 2007. Afterwards, reported thefts dropped off to around 3,000 for a couple of years before climbing again in the new detailed numbers provided by police for 2014 through 2016. So what else does this new data show? 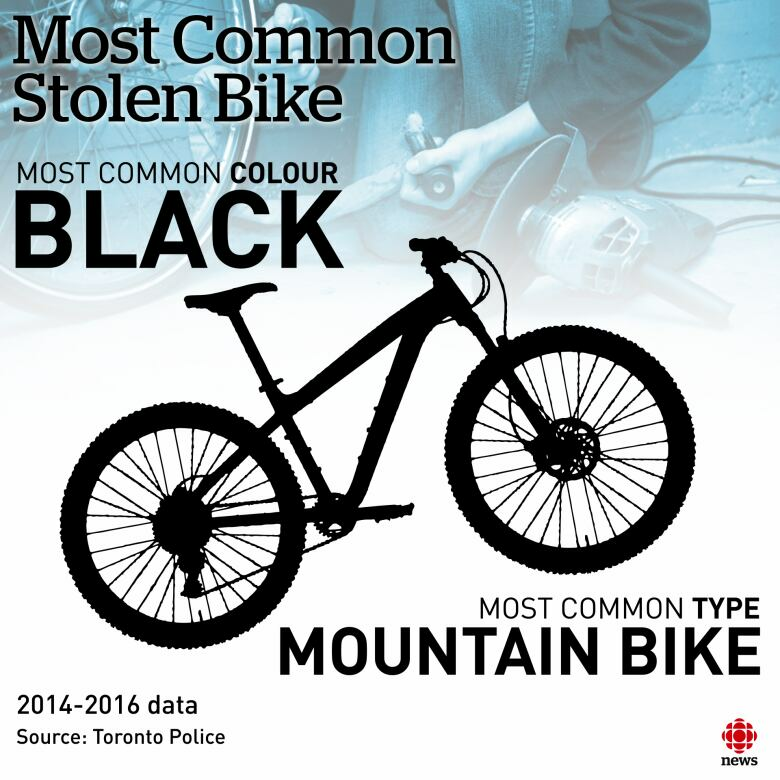 The most common colour bike stolen was black by a landslide, and the most common type stolen was a mountain bike. The worst months for bike theft are in the summer. Although the specific month was different for each year in the new data, June had the most stolen bikes in 2014, July in 2015 and September in 2016. 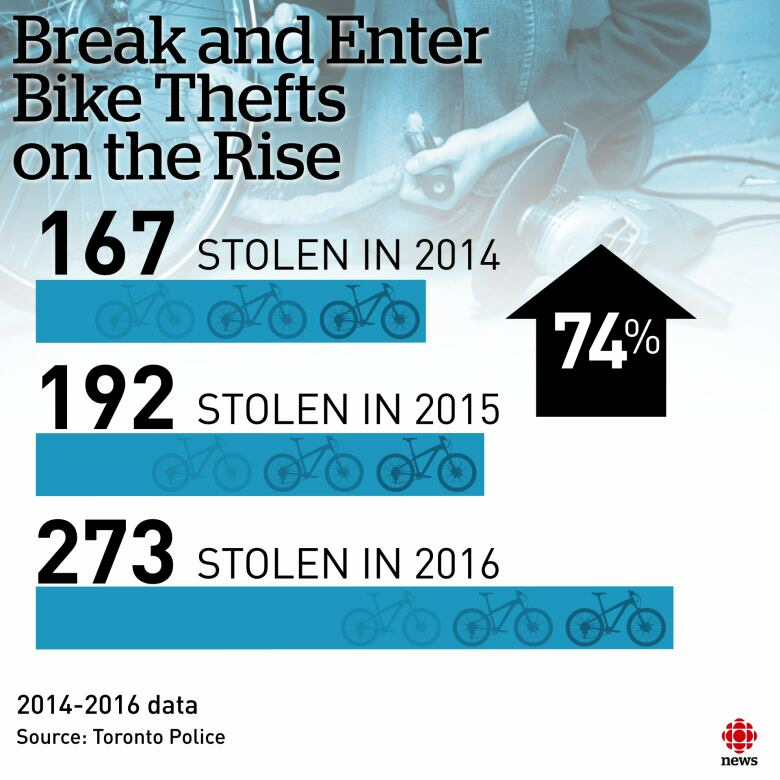 It also looks like more bikes are being stolen in break and enters. Between 2014 and 2016, the number of bikes stolen in this way rose 74 per cent. Ferry says more resources are dedicated to cases involving breaking and entering, because of how the bikes were obtained. More than 250 of the bikes stolen from 2014 through 2016 in break and enters were worth $1,000 or more, according to the owners. Jamie Kecskes knows what it's like for owners of those higher-end bikes. Kecskes thought his own were relatively safe in the locked garage in his backyard until two of them were stolen overnight June. It was the first time in more than 40 years of cycling that he'd had a bike stolen. One of them was worth $2,700 but the other bike cost him a whopping $11,000. "It was kind of like my mid-life crisis bike," Kecskes joked. "Some guys buy stereos, some guys buy fast cars. I bought an expensive bike." The bike had belonged to one of Kecskes's heroes, a professional racer in Europe. Unlike bikes stolen off the street, which police consider crimes of opportunity, Kecskes believes in his case the thieves knew what they were looking for. Kecskes says they actually moved another bike out of the way to get to the $11,000 one. "They knew the value of the bike," Kecskes told CBC Toronto. "I think they would have taken the other bike too if they had more hands." Kecskes hasn't gotten either of his bikes back. He reported them stolen, but only heard from police once after the initial report. He says he got a call a few days later suggesting that he check Kijiji and Craigslist. Besides the brazenness of how Kecskes bikes were stolen, the cyclist generally believes thieves in the city have reached a point where they just don't care. Even in cases where the theft is caught on video he says they're basically "flipping the bird at the camera." "They know that they are not going to get caught. It's like taking candy from a baby, " said Kolb. "I think that in terms of bike theft in the city of Toronto, we're at crisis levels." Coming up tomorrow: Find out the worst places to lock up your bike in the city as we break down bike thefts by neighbourhood.